Why is implicit grant important? The current state-of-the-art of web is that service providers expose their services as web accessible application programming interfaces (APIs) for users to build applications or consume services. One of the key aspects of designing an API platform is controlling who has access to data. Ideally, an API platform should be capable of allowing different levels of user access strategies where authorized consumers may get unlimited access to secure APIs while non-authorized consumers can only access APIs that are public. From the API platform perspective, granting access to different levels of consumers must be made as easy as possible . Most web applications access user data to provide application-specific functionality to the user. For example, applications may need to access users’ Facebook friends. However, requesting user credentials to access Facebook API from a third-party application poses a security risk to the user. As a result, many organizations provide different authorization strategies to access their APIs on behalf of the user. This has created a major requirement for a common global standard for securing APIs. This is where OAuth stands out among other standards. OAuth is an open standard for authorization and provides a method for clients to access server resources on behalf of a resource owner, such as a different client or an end-user. It also provides a process for end-users to authorize third-party access to their server resources without sharing their credentials, typically a username and password pair, using user-agent redirections . In OAuth, the client requests access to resources controlled by the resource owner and hosted by the resource server by giving a different set of credentials (not the resource owner’s credentials) to access the resource. 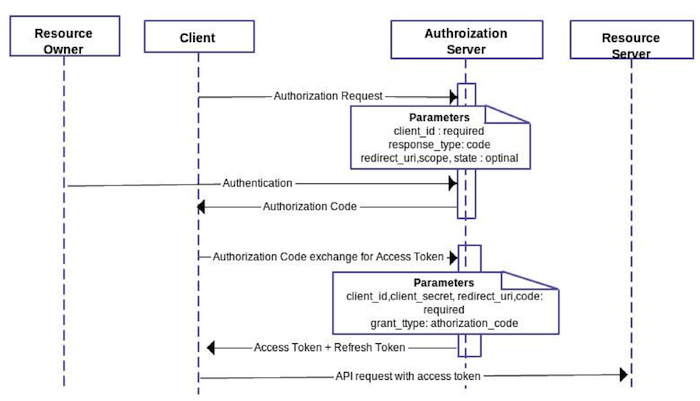 In OAuth, the client will obtain an access token from the authorization server, which can be used to access server resources on behalf of the resource owner. In this method, resource owner credentials will not be exposed to third-party application. This article will use OAuth 2.0  standard terms to describe OAuth functionality. Refresh token: This token is issued with the access token, but unlike the latter, it is not sent in each request from the client to the resource server. The function of the refresh token is to obtain another access token when the current access token expires after its lifetime. It will not always be possible for the client to obtain the refresh token from the authorization server. We will describe the refresh token action with OAuth grant types. The abstract OAuth 2.0 flow illustrated in Figure 1 describes the interaction between the four roles. 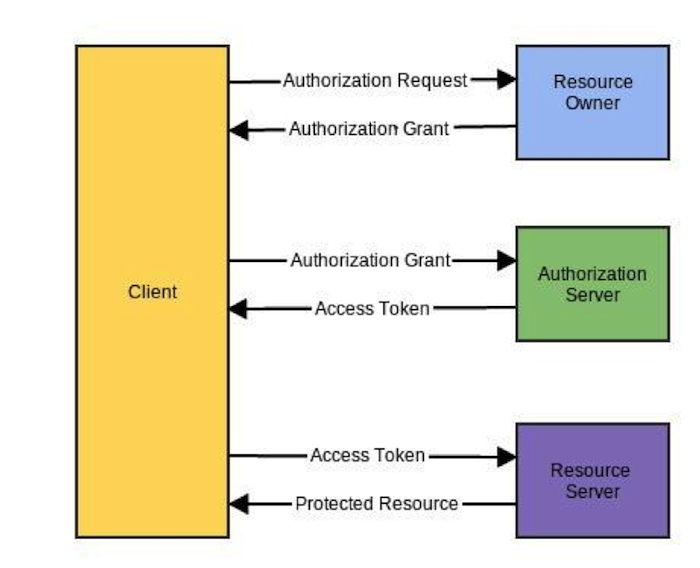 As shown in Figure 1, the client first requests authorization from the resource owner using one of four major grant types or a grant type extension. The authorization grant type depends on the method used by the client to request authorization and the types supported by the authorization server. 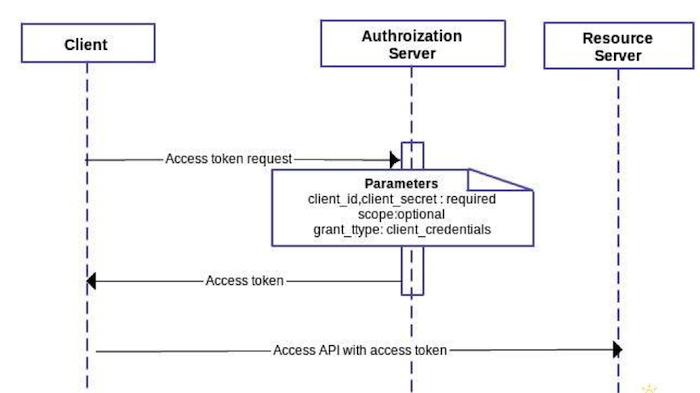 After the client receives the authorization grant, the client requests an access token from the authorization server presenting the authorization grant. The authorization server then validates the authorization grant and issues the access token for the client. After completing this step, the client can request access for the protected resource in the resource server by presenting the access token. This highlights the basic flow of obtaining access for the protected source by a client. An authorization grant type is a credential representing the resource owner's authorization (to access its protected resources) used by the client to obtain an access token . There are four major grant types available in the OAuth2 specification. The client can use any grant type depending on the scope of the application. The authorization code is obtained by using an authorization server as an intermediary between the client and resource owner. Instead of requesting authorization directly from the resource owner, the client directs the resource owner to an authorization server, which in turn directs the resource owner back to the client with the authorization code. Right before the authorization server redirects to the client with the authorization code, the resource owner needs to authenticate with the authorization server. Since the resource owner directly interacts with the authorization server, resource owner credentials won’t be shared with the client. There are some benefits with the use of this grant, such as the ability to authenticate the client as well as transmission of the access token directly to the client without passing it through the resource owner's user-agent and potentially exposing it to others, including the resource owner . Using this grant, access token is not visible to the client as it is stored in the client session. Figure 2 shows the authorization grant flow. Using this grant, the client will receive a refresh token that can be used to obtain a new access token when the current token expires. A refresh token is issued because this grant type is bound to the confidential client type. Take a scenario where some webapp is required by the client to view your Twitter profile. In this scenario, you are the Resource Owner. Similarly, the authorization server and resource server will be the servers from Twitter. Redirect URL bases attacks are possible with this grant type, hence redirect URI needs to be properly validated. The resource owner password credentials grant type is suitable in cases where the resource owner has a trust relationship with the client, such as the device operating system or a highly privileged application . Moreover, this grant type is more suitable for clients who are capable of getting the resource owner’s username and password via a form or other way without violating the resource owner’s security. It is mainly used when the client has been developed by the same authority as the authorization server . During this grant, the resource owner provides his username and password to the client, which then the client uses to request an access token from the authorization server with the client’s credentials. The authorization server responds to the client after successful authentication with the access token and the refresh token. Since the client type is confidential, a refresh token is issued from the authorization server. Figure 3 shows the flow of this grant. This grant can be used when the client connects to the same authority as in the authorization server. Think of a scenario where you have an account on foo.com and where you are the resource owner. foo.com exposes its services for external users via service.foo.com, which is the resource server. The client is the foo.com website and authorization server will be foo.com’s server. In this scenario, the client of foo.com uses the services exposed by foo.com for build application. In this scenario, both foo.com and service.foo.com are trusted by the client. Therefore, there is a risk of providing the resource owner’s username and password to access APIs. This grant is applicable when the client itself is the resource owner. This grant is used to obtain the access token by giving only the client credentials without having resource owner authentication. This grant can also be used in server to server authentication and to access APIs without the need for end-user permissions, such as application developers. The client will request the access token from the authorization server presenting client credentials. With this grant, the resource owner’s authentication is not needed. This grant type can only be used with confidential clients. Figure 4 shows the flow of obtaining the access token using this grant. A refresh token will not be issued by the authorization server with this grant. Let’s say company foo has SDK to develop applications with their APIs for application developers. The resource owner is you as the application developer. Since you are not a end-user, you do not want to authenticate with foo to obtain the access token to build your applications. In this scenario, the client will be the SDK . Implicit grant is based on redirection based flow. As a result, the client should be capable of interacting with the resource owner user agent (such as the browser) to obtain the token from the redirection URI coming from the authorization server. The implicit grant type does not require client authentication, and relies on the presence of the resource owner and the registration of the redirection URI. The resource owner needs to authenticate with the authorization server to obtain the access token. Because the access token is encoded into the redirection URI, it may be exposed to the resource owner and other applications residing in the same device . The client requests for the access token with the client ID and grant type with optional parameters as in Figure 5. Figure 5 describes the complete flow of the implicit grant. Since the resource owner authenticates directly with the authorization server, his/her credentials will not be shared with the client. With this grant, the refresh token will not be issued for the client as the client type is public. Implicit grant type is the least secure grant type among other grant types. Because the token is expose to the client side application, it can be stolen by an attacker. Another dangerous security risk is that the client is not aware if the particular token is generated for him/her or another client. Therefore, an attacker can gain access to protected resources. 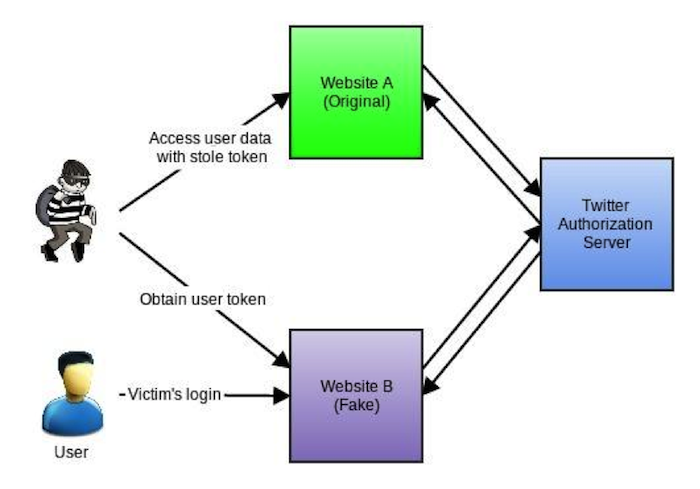 Figure 6 shows a particular way of stealing a user token by an attacker. Let’s say website A allows users to login via Twitter. The same way, the attacker will create a website called website B, which allows users to login via Twitter as well. When a user logs in to the attacker’s fake website, the attacker will grab the access token from the URI fragment. Now, the access token can be used to login to access user data through website A by manipulating the access token in website A. These kind of attacks can be avoided by having proper token validation in the client side’s application. If the authorization server can provide details, such as which client_id belongs to a particular token, then the client can refuse requests that do not match with the access token and the client ID. The user will register to API Manager and add an application and subscribe to the backend service, which will provide the user’s purchase goods. Figure 7 shows the view of adding a new application from API Manager. Note that callback URI is important for the implicit grant type where the authorization server will redirect the access token for the URI specified in the application. 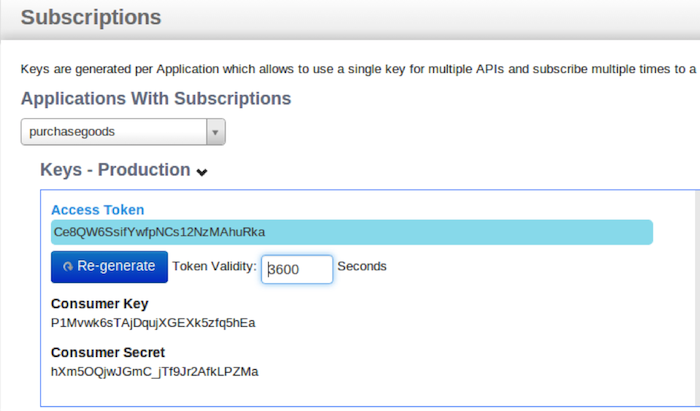 Then the user can generate client_id and a secret from the application subscription view. Note that the consumer key and consumer secret is known as client_id and client_secret. Implicit grant only requires the consumer_id(client_id) to get the access token. 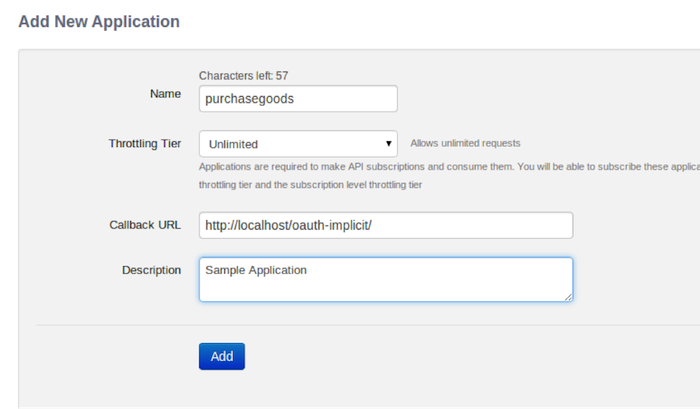 My sample application contains a simple interface that requires resource owner access to view the purchase goods as in Figure 9. You as the resource owner needs to grant permission to access data via clicking the Access Data button. At this moment, the application sends the authorization request to the API Manager authorization endpoint with the client_id. As implicit grant specifies, the resource owner needs to authenticate with the authorization server to provide an access token. WSO2 API Manager uses WSO2 IS backend as the authorization endpoint. Therefore, you will direct to WSO2 IS login interface as in Figure 10. After successful login, you will need to provide access to the third-party application to access your data through the interface in Figure 11. After successful authorization, the application will receive the access token in the redirected URI fragment to access protected resources. My sample application will take the access token from the URI fragment and show the data of the user as in Figure 11. As you can see in Figure 11, the access token is in the URL as a fragment with the token expiry time.